1) demolition debris from the mid-1970's project of Argentina's military dictatorship to clear out marginalized urban neighborhoods and lace the capital district with highways, Robert Moses-style. This material was used to construct the perimeter levee about 20' about mean sea level. 3) the biological and geological excess of the Rio Paraná, one of the worlds largest rivers and the main source of water in the Rio de La Plata, which produced a 24' flood in 1983, flushing massive amounts of suspended sediment and biological excess from the subtropical zones of South America (seeds, animals, rhizomes) over the perimeter walls of the future Reserva, where some of it settled out. In a co-authored paper (with architect Erin Putalik) I go into more detail about this extreme and instructive case of a fairly common condition- semi-intentional landscapes produced through the processes of urbanization- in this case, by a megacity on the banks of one of the largest rivers in the world. This thinking tries to further Alan Berger's important work on drosscapes and Pierre Belanger's work on landscape as infrastructure. The three processes listed above came to a head in the mid-80's, and since then the landscape has become an important social and ecological space inhabiting the liminal zone between city and river (or really, estuary). 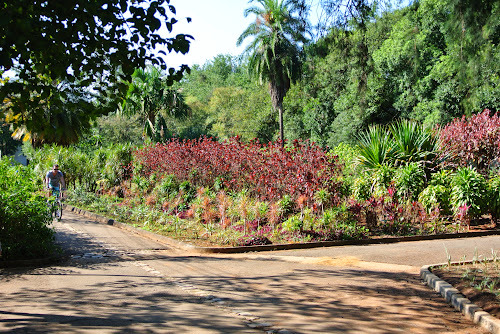 Components such as the levees and interior topography are intentional and anthropogenic, while the vegetation and micro-topographies were constructed by the powerful geological and biological force that is the Rio Paraná. But let's talk a bit more about the vegetation. While much of it is autochthonous and originally unintentional, it is also directly affected by the composition of the perimeter levees and interior subsoil- the busted brick, concrete, rusting steel, the contaminated sands and fine clays dredged from the port, as well as the exaggerated height differences caused by the perimeter levee. These unique conditions have produced a strange subset of regional riparian species and favorites from the private patios and gardens around the city, whose seeds are deposited here by birds and winds and who can exist on the rocky exterior levees and elevated platforms or the contaminated mudflats. 3) expand local knowledge (presumably both professional and public) about native species and their ecological role in the context of Buenos Aires and the Rio de la Plata estuary. The existence of a plant nursery in a public park is very intriguing from a landscape architectural perspective, especially given our current (well-placed) interest in productive landscape and ecological performance (I would add sustained engagement with places to that, though that isn't really a widespread interest yet). 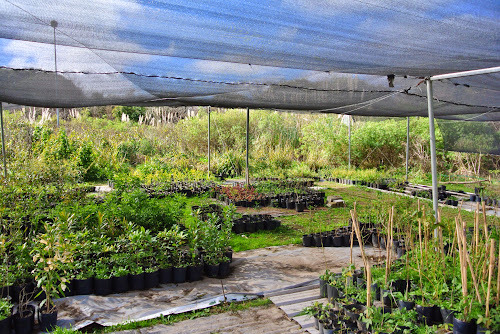 As the great Nelson Byrd Woltz Orongo Station project in New Zealand showed, locating practices and instruments of plant propagation and cultivation for distribution in a wider landscape in that same landscape can be visually stunning, effective, and meaningful. 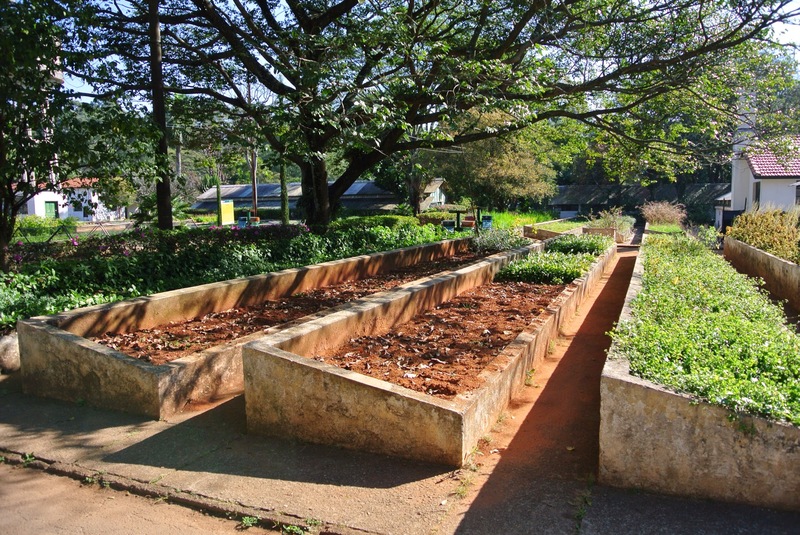 Plant propagation and cultivation is a realizable, specific instance of productivity and performance, and considering how to integrate these practices into a public landscape is a promising way forward for enriching urban public spaces. But there are two things in particular about this nursery that are especially interesting. I had a chance to visit this place and speak with some of the workers there, and they revealed an interesting detail- the plants are propagated seed and specimens collected on site. This practice requires more knowledge of the existing landscape and integrates with typical management practices of clearing and cleaning the public spaces, as well as ongoing scientific practices of documenting species and their behavior. In addition, the plant material tends to be exceptionally well-suited to the particular conditions of the place (the existing mycorrhizal communities, or soil contaminants for instance). Secondly, the location of the nursery is unique- upfront by one of the two main entries, at the nexus between the container port to the north, the city to the west, and the rest of the Reserva. Currently, despite being steps off the main path, the connection between the public route (on top of a levee) and the nursery grounds is ad hoc- a muddy path strewn with earth-moving machinery leading up to the office. But, one could imagine a unique circuit taking visitors around or through the nursery, with ever-changing vews out toward the port, the city, the estuary, and the rest of the Reserva, and interior views of the production spaces and operations (most occurring at the languid pace of vegetation growth). Currently the potted plants in the covered zones blend into the autochthonous vegetation of the Reserva, the shade cloth and hoop house offering some architectural articulation within the mutant, verdant landscape. It's all very confusing, and yet it is a great way to be introduced to this massive public landscape that has perched itself between Buenos Aires and its estuary.